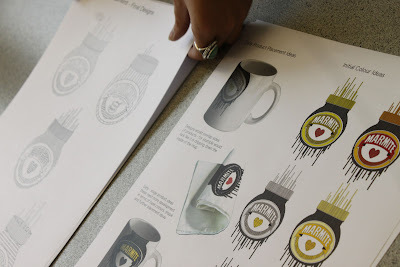 There are some perks in having the blogger ‘nom de pixel’ MsMarmitelover: last week I was invited to join a panel at the Royal College of Art to judge designs for the next range of Marmite merchandise. We were looking for something to replace the current line, based on Andy Warhol’s style, and we sat all afternoon while a dozen or so talented students showed us their ideas. The winner would see their design produced on mugs, plates, etc. 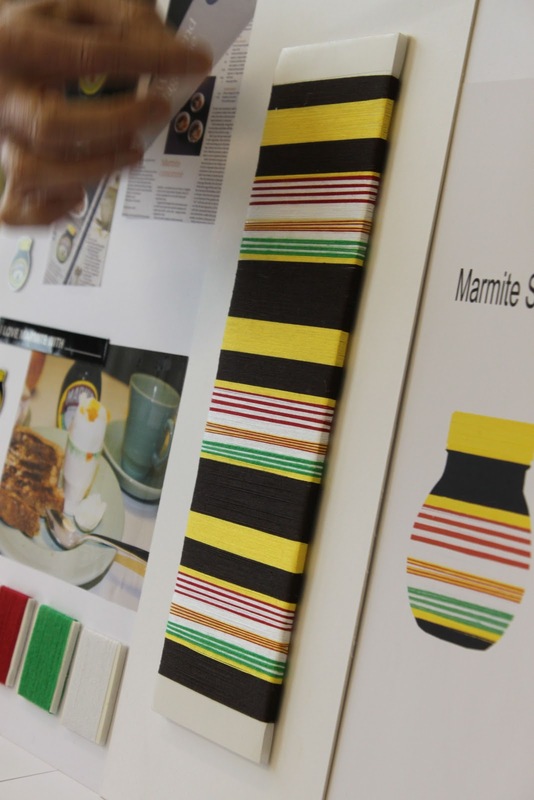 The Marmite brand lady talked about Marmite: it only has a shocking 9% ‘penetration’ (the percentage of shoppers that buy it). Few ‘pre-families’ buy it. What/who are ‘pre-families’? People who haven’t settled down and had kids yet. People have Marmite in the family home, but when they leave to go to university, they don’t continue to buy it. But they start buying it again when they have kids. 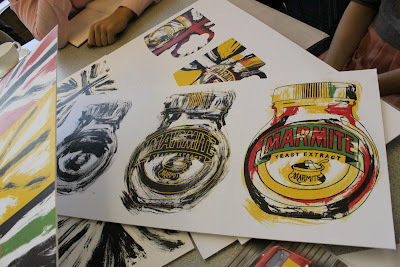 We need to encourage our young people to buy Marmite! It was difficult to pick a winner. Every student was stunningly gifted but we had to consider if the designs would translate to mugs, tea towels, plates, oven gloves. 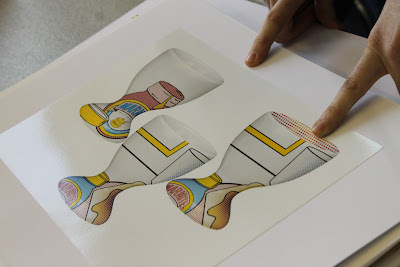 We also had to think whether the designs would have longevity; the range is planned to come out at the end of 2012. For instance, I love the shabby chic retro look, but part of the appeal may be based on the fact that we are living in times of economic uncertainty. We are not looking to the future, but the past. Assuming we will be buried in double dip austerity during 2012, will we be desperate for a bright cheery futurist vision by then? “What did people buy after the last Great Depression?” I asked finally. “Well we went straight into World War II”grimaced Corinne “but after that it was the New Look and the fifties”. Ah yes, the kodachrome colour palette of the nuclear pop star Elvis…. It’ll be interesting to see what happens next in the zeitgeist as reflected in design. 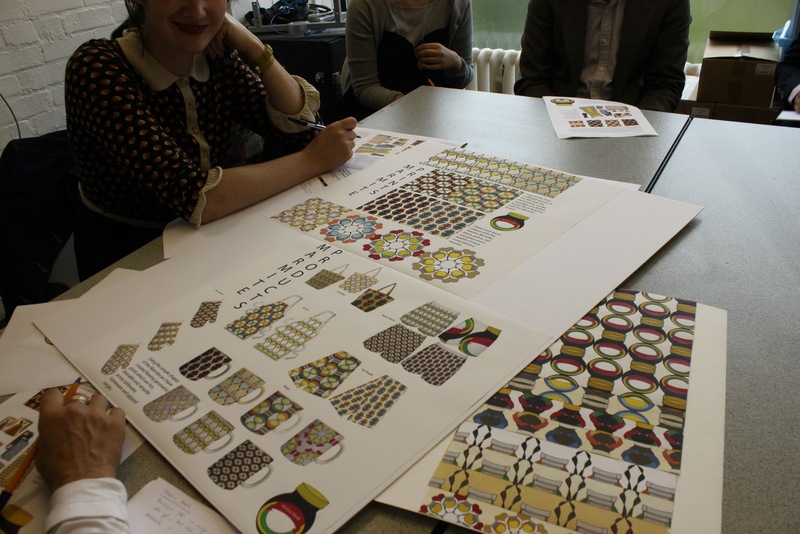 Jessica Meek came up with an Orla Kiely influenced fabric design. We liked her boxer shorts. 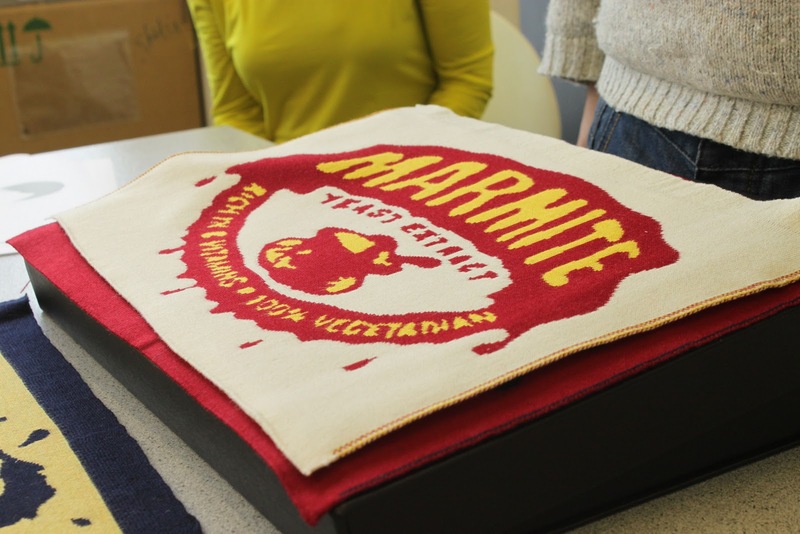 Much of Marmite merchandise is for ‘gifting’ rather than ‘self-purchasing’ (retail lingo for buying it for yourself) and Marmite boxer shorts would be a great Christmas gift. (And men are always so hard to buy for). I would have liked to have seen Marmite bra and knickers. 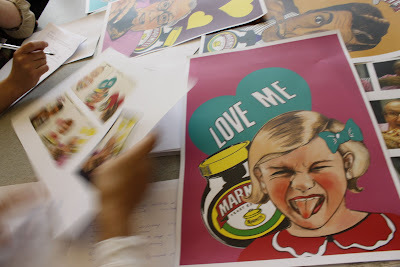 There is something naughty, even S & M about Marmite don’t you think? 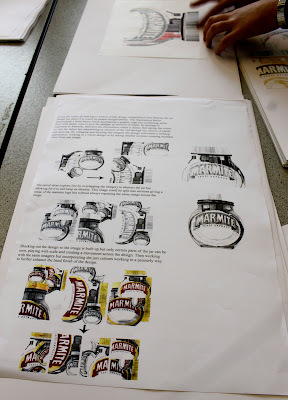 Amy Ellis’ drawings, nicely done but perhaps too reminiscent of drinks packaging? Amelia Mullins accurately pinpointed the humour in the Marmite brand. 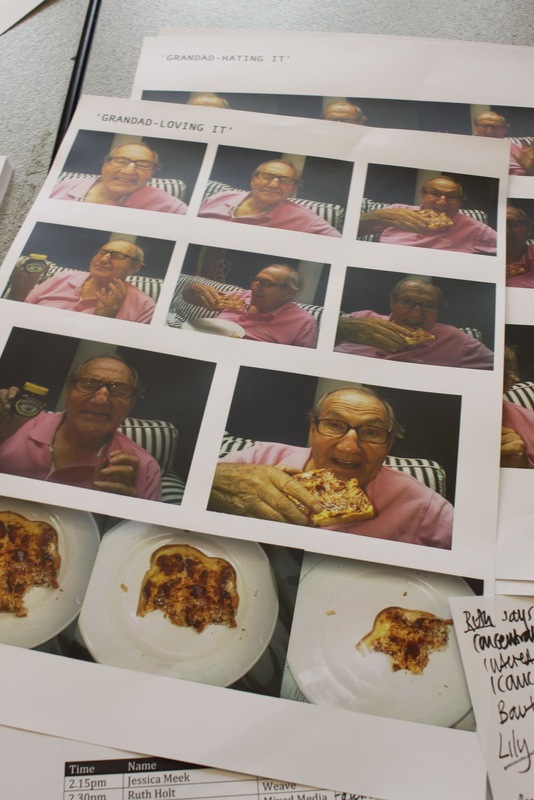 She did photographic research of ‘haters’ and ‘lovers’, their expressions. This is her grandad loving it. She cam up with a ‘happy families’ concept of different characters loving or hating Marmite. I really liked this, it also had retro advertising appeal. 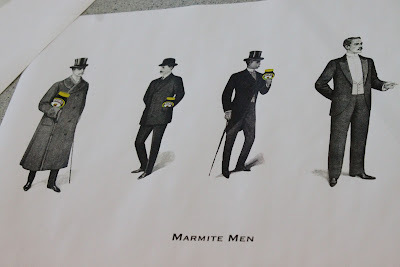 Charlotte Brown harked back to the 1902 beginnings of the Marmite brand with her Victorianesque ‘Marmite Men’. I would probably buy plates ect with these designs as it would go with the look of my kitchen. But there weren’t any ‘Marmite Ladies’ and it was a bit too Phileas Fogg in style. The John Lewis lady remarked that the most popular selling kitchen colour, apart from neutrals, is red. 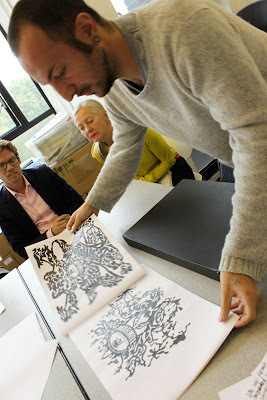 This took weeks to cross-stitch, the student even took it on holiday, but it was left unfinished. I like it that way. I really loved this embroidered and quilted marmite designs from Alexandra Palmowski but it was felt that it wouldn’t translate onto ceramic. 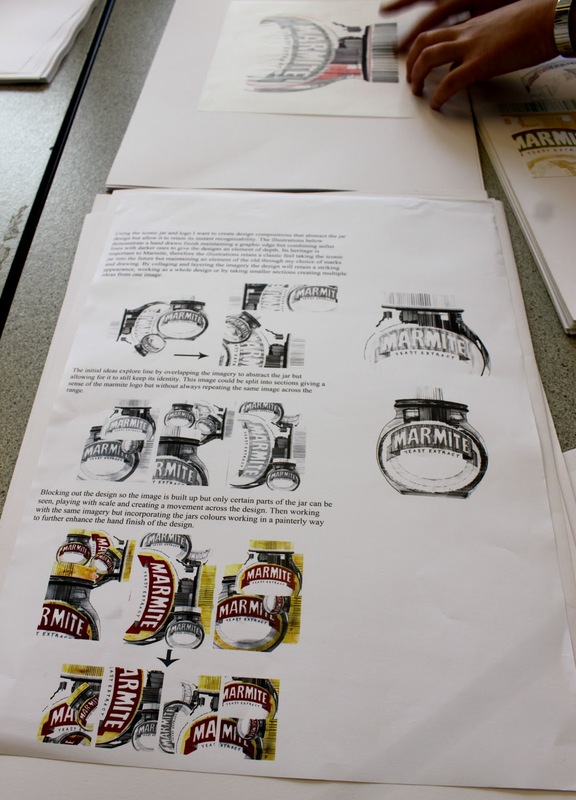 Lily Kamper used her trademark style of graphic lines in her Marmite project. The panel weren’t sure that the lines translated properly….they could look like birthday cake candles. Beautifully drawn though. Carlo Volpi almost had it with his ornate marmite designs on paper and knitwear but they were a bit too goth, too dark for people’s kitchens. Carlo, an Italian, had never tasted Marmite until he entered this competition! Expressionist Marmite from Tiphaine Alston. We loved the paintings but weren’t sure it would work as home ware. 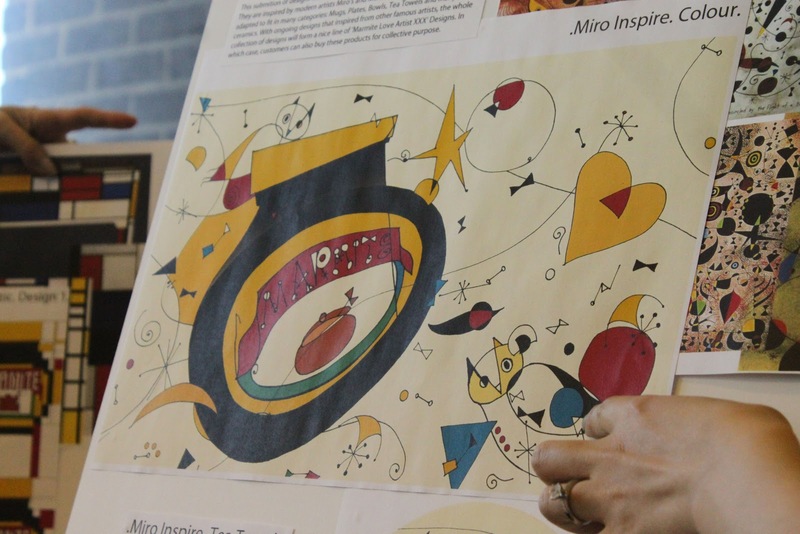 She even did a mock up of her design on a bus. 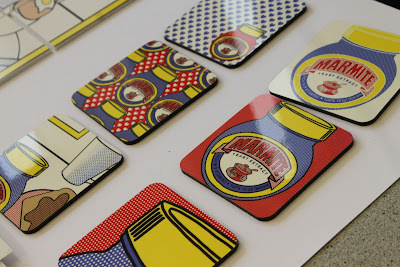 Lichtenstein themed designs from Joanna Burdett in a beautifully presented and executed project. 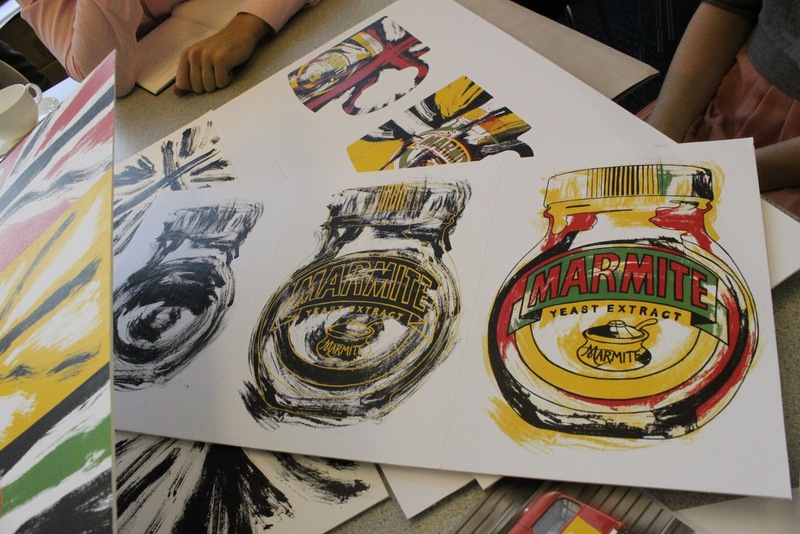 Panellists were a little worried that it was too similar to the Andy Warhol style merchandise. Interesting Miro influenced work by Ying Wu. Expounding on Marmite’s heritage British qualities she said “And here we have a traditionally British animal, the owl, showing that you can eat Marmite at night or by day”. Huh? Is an owl typically British? Perhaps in Harry Potter. It’s always interesting to see how others see us. 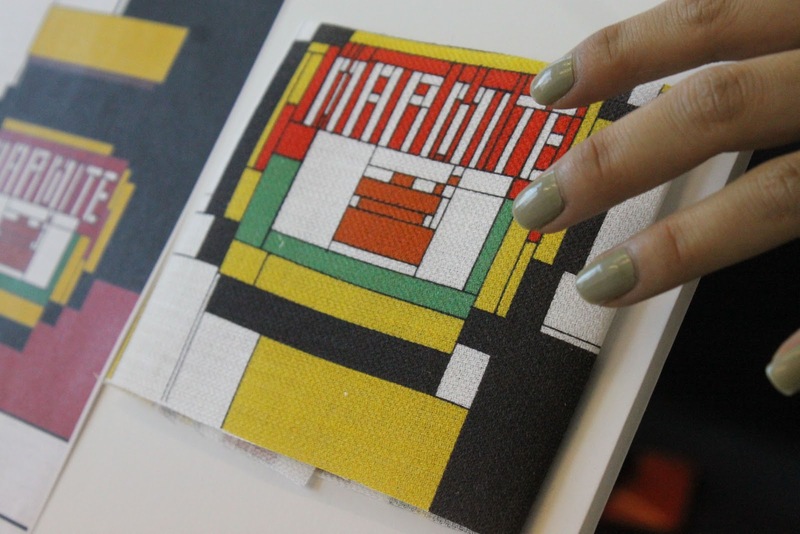 Ying also did a clever Mondrian style depiction of Marmite. It was a long afternoon’s work and a tough decision to decide the winner. We plumped for Joanna Burdett’s Lichtenstein designs which were also the most popular on Facebook with 100 ‘likes’. She’d worked outside in industry prior to coming to the Royal College and her sheer professionalism and experience was evident in her well thought out presentation. As well as nurturing their design talent, the Royal College of Art teach students how to sell their work to companies, essential skills and it really paid off for Joanna. Cool. Very interesting. 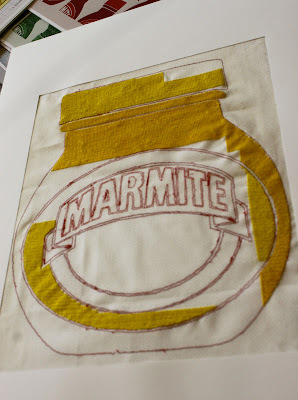 Off to make Marmite on Toast. 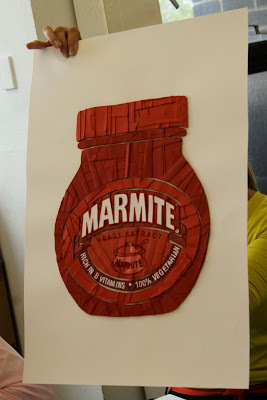 I am reminded that I once smeared marmite over a beef joint and slow roasted it. Very yummy. Love this post. All the designs are good, but Joanna and Jessica's were my favorites! Ditsy dots repeated in a design is comforting when faced with double dip recessions… Can't really say why, except it feels retro and familiar. 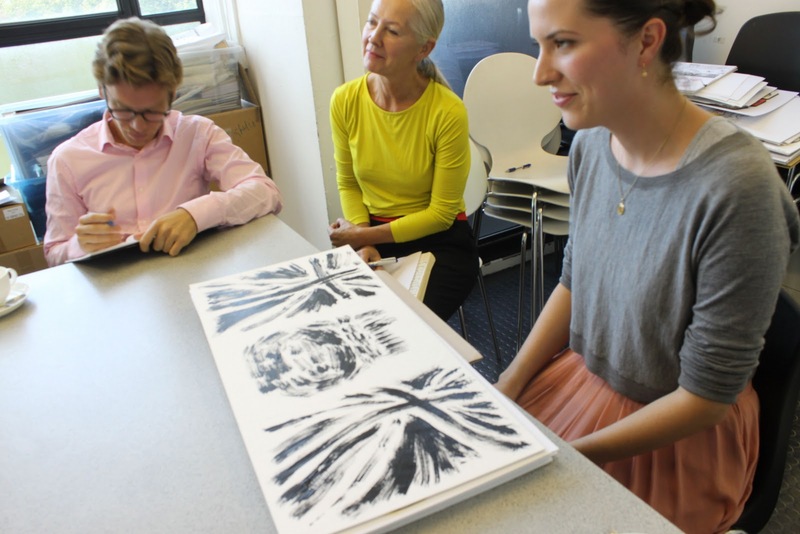 wow – what a fun thing to do! 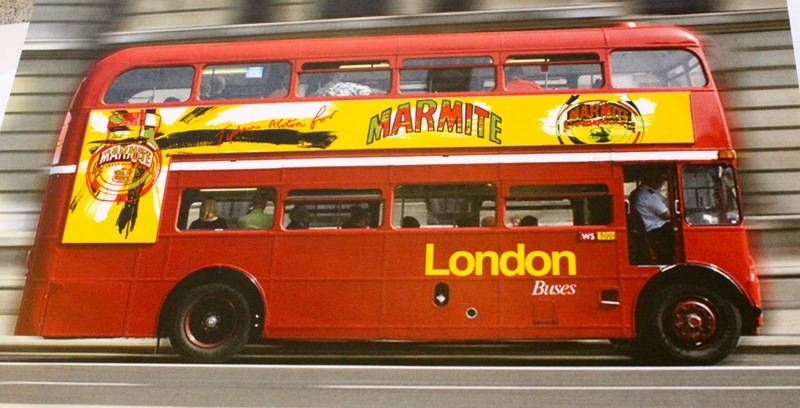 I'm a massive Marmite fan. 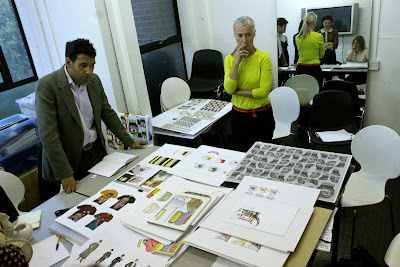 can't wait to see the new designs come out next year. Astounding that only 9% of people buy it. Who'd have thought it? Can't imagine not having a pot in the cupboard!